One of the next big challenges in VR is delivering touch sensations. How we touch and feel things is complex and organic, and interacts strongly with our other senses. We have heard that the virtual era is dawning for what seems like ages, but recent technological developments make it feel like we are finally on the edge of explosive growth. With the launch of several brands of virtual reality headsets hitting the mainstream market, we're ready to begin creating an immersive computer-generated world in which we can be teleported to a distant galaxy in order to better understand the origin of the Universe and the meaning of life, build a virtual space station, or have some fun fighting off alien invaders. But do the new headsets, truly deliver a compelling experience that can be compared with Real Reality? To be human is to sense. Complex sensory systems that work overtime, and in seamless unity, are the core of our reality. And, yes, vision is key among them. But consider this. You’re walking down a street with the warmth of the sun on your shoulders, the gentle breeze on your face, the smell of cut grass, contours of the pavement under your feet, and you hear a car. Your head instinctively twitches a couple of degrees left and right, and you sense that it is coming from behind. The sound is growing louder, so it’s coming fast; it sounds like a V8—maybe a classic Mustang – and as it passes you, you hear the Doppler effect in the change of engine note, feel the gust of shockwave, and are left with the lingering smell and taste of not-quite-burnt fuel. That paragraph above paints a sensual picture, but it contains no visual-input references. 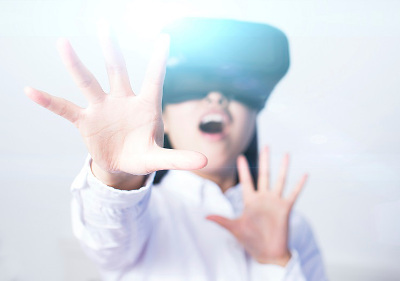 There are many approaches now being taken to address the visual aspect of VR, ranging from the stereoscopic display approach used by many manufacturers, to the direct projection onto the retina as developed by others. But while strapping on a headset that fills your eyes with a new set of pictures is a decent contribution to VR, it is not the full answer. As the example illustrates, our other senses need to be properly augmented too, in order to create a compelling virtual world. Fortunately, start-ups like Ultrahaptics are developing the technology to stimulate these other senses. One of the next big challenges in VR is delivering touch sensations. How we touch and feel things is complex and organic, and interacts strongly with our other senses. There are different types of tactile sensation—when you reach out and touch or pick up an object; when something touches you, like a raindrop on your head or the hustle-bustle of a crowd, or the feeling of something intangible like the wind in your hair. All convey vital information. So how to add this to our VR repertoire? Assuming our hands and head are the crucial elements for control, we need to know where they are and what they are doing. Head tracking is incorporated into VR headsets, but knowing what your hands are up to is trickier. Solutions using optical recognition and radar to interpret hand position and gestures look promising and are being developed, and touch panels are commonplace. But what about the actual tactile sensations—touch and feel? There has been talk of gloves, or even whole body suits festooned with actuators so that forces and pressures can be imparted on various parts of the body to bring the tactile sensations we associate with reality into a virtual existence. This approach seems a bit cumbersome, however, and almost certainly outside the price bands for consumer market volumes. A more promising technology utilises ultrasonic pulses to energise air in specific locations to create a sort of force-field that can be felt. This method can even energise the air where a user’s hand is detected, and create a virtual touch sensation. Combined with good VR graphical effects, this method can create the highly compelling sensation of touching controls or holding a virtual object. You could feel your way through a zombie-filled labyrinth or around the SpaceX Mars Station. Objects in game-play could be felt—like pressing a button or pulling a lever, or making a catch in a ball game. Moreover, ‘soft’ tactile sensations could also be conveyed, like air movement or environmental effects. In a gaming environment, this technology could even be used to feel blows from an opponent in a martial arts contest, or the impact of a gunshot, adding some visceral weight to the virtual risks taken by trigger-happy gamers. For Virtual Reality to succeed in the mainstream market, the sensation has to be truly compelling. The first step is to understand that reality is so much more than just sight and sound. Senses in VR have a multiplier rather than summative effect—each one added makes a huge difference to the user-experience. That’s not to belittle the initial visual offerings coming to market, but to make it clear that they are only the start of a vast new virtual world of commercial opportunity.